Thirty years ago, a peat cutter working in the Cheshire countryside spotted what he thought was a piece of wood trundling along a conveyor belt. Tasked with the job of keeping the belt free of debris, he threw it away, but as it hit the ground, the dirt fell from it and the remains of a human leg lay in the summer sun. That gruesome discovery on 1 August 1984 led to Rick Turner, the newly-appointed county archaeologist, being called to the site on Lindow Moss. He says what followed were "the most exciting days of my archaeological career". "I was taken out on to the moss and shown where the previous day's peat had been taken from," he says. "Walking the uncut sections, I found a flap of dark, tanned skin projecting from below. "Reporting my discovery to the police, we agreed I would be given a day to excavate the remains." On 6 August, the site was recorded and sampled, the limits of the remains were established and "Lindow Man was lifted - within his block of surrounding peat - on his way to international celebrity", Mr Turner says. A spokeswoman for the British Museum, where the body is kept, says it was "one of the most significant archaeological discoveries of the 1980s [which] caused a media sensation". "Conserved for nearly 2,000 years by the acidic, anaerobic conditions, it was possible to make out his facial features, a distinctive furrowed brow with close-cropped hair and beard," she said. "For the first time, it was possible to see the face of a person from Britain's prehistoric past." As Mr Turner puts it, "bog bodies always have produced a remarkable response in those lucky enough to find them and those who see them preserved in museums". "He was hailed as Britain's first bog body, to match the famous examples from Denmark, such as Tollund and Grauballe Man." He said interest in the bodies came from the fact they "appear to have cheated death [to] give us a remarkable insight into our late prehistoric past". Examinations of Lindow Man showed he was in his 20s, of average height, well-built and in good health. Closer inspections have shown he suffered from intestinal parasites and his last meal was unleavened bread. Radiocarbon dating has put his death, which was extremely violent, as being sometime in the 1st Century AD. Despite so much being learnt, according to the University of Manchester's Professor Anthony Jones, who has led a walk across Lindow Moss to mark the 30th anniversary of Lindow Man's disinterment, there are still questions to be answered. "We know he was killed by blows to the head, garrotting, swallowing mistletoe and then drowning in the waters of the peat bog. "But we don't know for certain why he was killed or whether he was willing." Theories about his demise have formed the backbone for several exhibitions, though the most recent one - at Manchester Museum in 2008 - took a different view. Bryan Sitch, the museum's curator of archaeology, says Lindow Man was "deliberately divorced from interpretation [with] visitors encouraged to make up their own minds from the information available". He says the exhibition included "the personal testimony of a forensic scientist, a landscape archaeologist, two museum curators, a former peat worker, a resident of the Lindow community and a Pagan [to show] the wide variety of meanings and interpretations". As a result, alongside a selection of Iron Age artefacts, the museum displayed laboratory equipment used to study of an ancient body, spades used to dig up peat, personal memorabilia about the unsuccessful Lindow Man repatriation campaign of the 1980s and a wand used in a pagan ceremony. Prof Jones says the prevailing belief is that he was sacrificed, though even that theory raises more questions than answers. "Lindow Moss was probably a site of religious significance where sacrifices were made. "But questions remain: why was Lindow Man sacrificed? How did his tribe see the future? And which gods were they trying to please?" Mr Turner says while it is true that these questions may never be answered, the theory of sacrifice is supported by other finds on the moss. "Lindow Man was not the first bog body from Lindow Moss. A well-preserved head had been found there in May 1983 [which] was shown to be about 2,000 years old. "In February 1987, another part of a human body was found and I supervised the recovery of over 70 pieces of a headless, adult male. "Finally in June and September 1988, parts of the buttocks and the left leg of Lindow Man were found close to the spot where his body had been excavated. "Together, these are best understood as religious human sacrifices made around the time the Romans took control of this part of England." Whatever the future reveals about Lindow Man, Mr Turner says it would be fitting to see his resting place for almost two millennia marked. "The findspot of Lindow Man is known and could be capable of commemoration. "As far as I know, of all bog bodies, only the burial place of Tollund Man has a marker. "Perhaps Lindow Moss could become a centre for outdoor sculpture inspired by its archaeology, history, and future uses." That idea is one that is backed by the University of Manchester's Dr John Handley, who took part in the walk to commemorate Lindow Man's discovery. He says he would like to see things taken a step further to see the whole of the Moss protected. "This is a very special, atmospheric landscape with great cultural and historic significance; it deserves to be restored, conserved and celebrated. "Lindow Man is the figure who animates this landscape and with the help of the British Museum and Manchester Museum, we need to reconnect him and his story to his original home." Certainly visitors to the 2008 exhibition believed the British Museum should not be his final resting place, echoing the failed 1980s repatriation campaign. One woman said the show had brought him "back where he belongs", while another asked "why can't he stay in Manchester?". 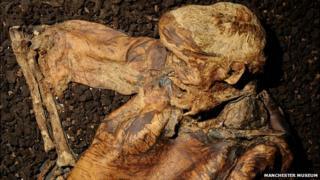 The British Museum said there were no plans to permanently move Lindow Man back to the North, but given how his story has twisted so far, who knows what the future may hold for him.